Industry and Member News for the Fabricated Geomembrane Industry. FGI PRESENTS ENGINEERING INNOVATION FOR OUTSTANDING PROJECT AWARD TO HULL & ASSOCIATES, INC. The Fabricated Geomembrane Institute (FGI) at the University of Illinois at Urbana-Champaign presented two (2) Fabricated Geomembrane Engineering Innovation Awards during its biennial membership meeting in Houston, Texas on February 12, 2019 at the 2019 Geosynthetics Conference. 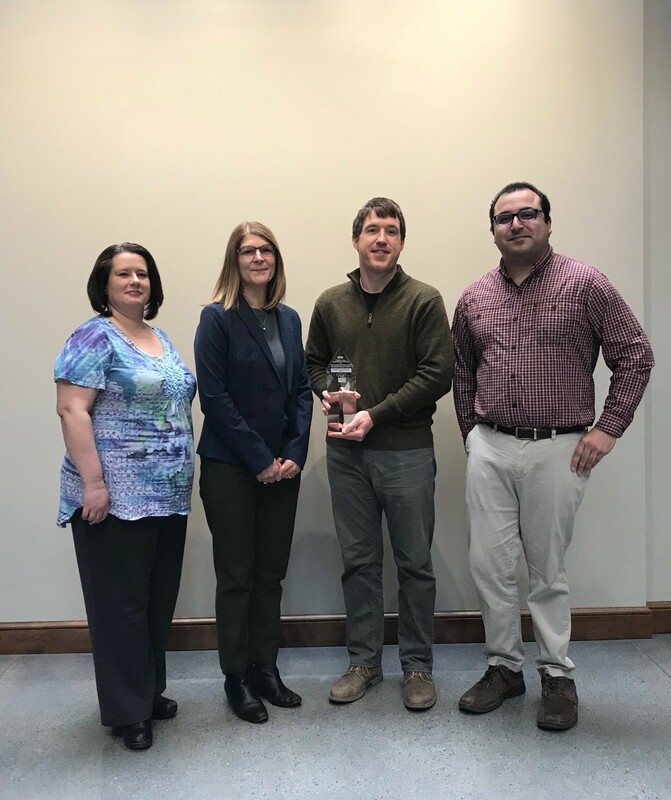 The 2019 Engineering Innovation Award for Outstanding Fabricated Geomembrane Project was presented to Hull& Associates, Inc. (see Figure 1) for the Montour Ash Landfill-Contact Water Basin Project. Coal Combustion Residuals (CCRs) are by products of the combustion of coal at power plants owned by utility companies and power producers. CCRs are typically stored within surface impoundments as wet slurry or into landfills as dry CCRs. One type of CCR, fly ash, can be used for beneficial use in concrete. In some cases, fly ash may be extracted from dry landfills for beneficial use. In preparation for the harvesting of fly ash from the existing closed landfill at the Montour Power Plant, a contact water basin was constructed in 2018 downstream of the landfill. The contact water basin was constructed to manage contact water that would be generated when surface water contacts exposed fly ash during harvesting operations. The initial permit application for the basin included a composite geosynthetic liner system consisting of, from bottom to top: an engineering subgrade with underdrain system, geosynthetic clay liner (GCL),60 mil textured high density polyethylene (HDPE) geomembrane, non-woven cushion geotextile, and a protective stone layer. Hull & Associates, Inc. (Toledo, OH) prepared the basin design to manage the runoff anticipated from a 25-year/24-hour storm event, while also providing temporary storage of any sediment-laden material within the basin. Prior to construction of the composite liner system, Owens Corning and CQA Solutions approached Hull to propose the use of a RhinoMat Reinforced Composite Geomembrane (RCG) as a moisture barrier between the underdrain and GCL to aid the construction process due to the extensive precipitation that was occurring in the area. To ensure that the RhinoMat andGCL interface would not pose an interface friction and slope stability risk and would meet permit requirements, Hull initiated laboratory shear testing of the material prior to construction. The testing indicated that the materials would be stable with the 4H:1V side slopes of the basin. The contact water basin design is approximately 1.9 acres in area, with 4H:1V side slopes, and a depth of roughly 11 feet. Factory fabrication of the RhinoMat geomembrane resulted in four panels being created,three of which were identical size, and relatively square in shape (160 ft. x170 ft.). The fourth panel was fabricated into a 120 ft. by 155 ft. rectangle.Panels were designed for optimal placement and deployment direction for ease of installation based on the proposed basin configuration and to minimize field seaming and testing. Installation of the RhinoMat geomembrane began at approximately 8:00 a.m. on the morning of July 21, 2018. All four panels were deployed and placed in the anchor trenches before noon on that day, using a crew of approximately eleven (11) people. A 0.5-inch rainstorm began at approximately 12:00 p.m. that afternoon and prevented any welding the rest of that day. However, the deployed RhinoMat protected the engineered subgrade, and prevented damage to the previously exposed underdrain system. On July 22, 2018, the basin was partially full from rainfall. Water had to be pumped from the basin to ensure that panel edges were dry enough to complete the three connection field seams. Once these seams were complete, they were non-destructively tested, and boots were installed around the two inlet pipes. RhinoMat installation was deemed complete on the afternoon of July 22, 2019, just a few hours prior to a historic rainfall event. The week of July 23, 2018 brought over 11 inches of rainfall to the Washingtonville, PA area, causing historic flooding and damage to roads, bridges, and flood control structures. 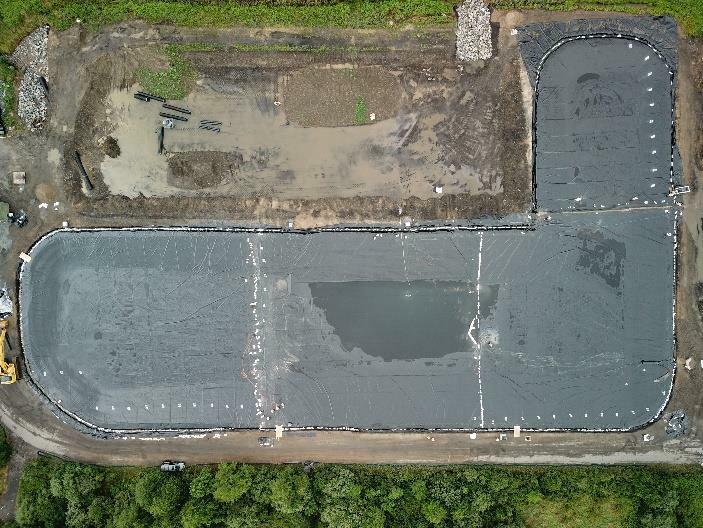 Rapid installation of the fabricated RhinoMat geomembrane on July 21 and 22 provided protection for the engineered subgrade and underdrain in the basin, which would have otherwise been damaged to the point of required reconstruction, and over of $100,000 in rework. The RhinoMat withstood the rainfall, and served as a high-performance moisture barrier within the composite liner section of the basin design. This is an example of the benefits of the high quality and rapid deployment of fabricated geomembranes and how fabricated geomembranes can help solve construction challenges, while also meeting design intent and permit requirements. The Fabricated Geomembrane Institute(FGI) is pleased to welcome its newest manufacturer member, TenCate Geosynthetics (www. tencategeo.us). TenCate is headquartered in Pendergrass, Georgia and serves the market globally with two commercial divisions – TenCate Geosynthetics and TenCate Industrial Fabrics. TenCate specializes in providing the highest quality geosynthetics products and solutions that enhance the world’s infrastructure, protect the environment, and conserve natural resources. Their FGI liaison is Brian Baillie, Commercial Director – Environmental Infrastructure Group, who can be reached at b.baillie@tencategeo.com. Please help us welcome TenCate to the FGI!!!! FGI PRESENTS ENGINEERING INNOVATION AWARD TO J.C. YORK, P.E. The Fabricated Geomembrane Institute (FGI) at the University of Illinois at Urbana-Champaign presented two (2) Fabricated Geomembrane Engineering Innovation Awards during its biennial membership meeting in Houston, Texas on 12 February, 2019 during the 2019 Geosynthetics Conference. 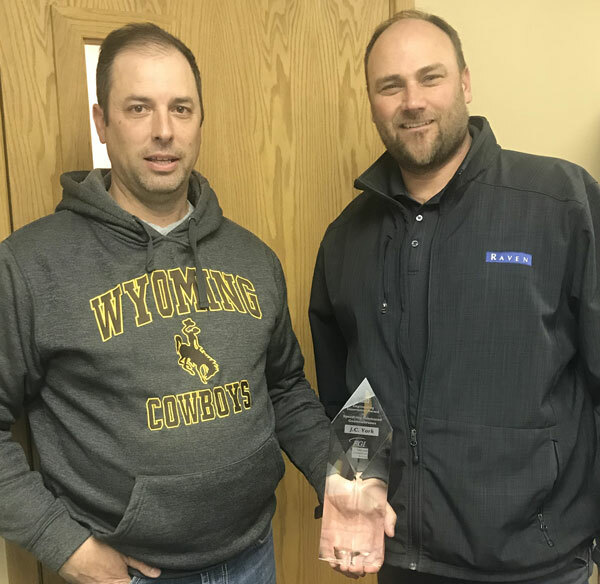 The 2019 Engineering Innovation Award for Specifying Fabricated Geomembranes was presented to J.C. York of J& T Consulting, Inc. (see Figure 1) for the Fort Lupton Terminal Reservoir and the Taproot Water Storage Pond Projects. The Fort Lupton Terminal Reservoir is a raw water storage facility that was built to serve North Denver and surrounding cities. The Northern Colorado Water Conservancy delivers source water to the city of Fort Lupton and Tri-State through a pipeline that terminates at Fort Lupton’s Water Treatment Facility. The pipeline requires general maintenance annually, which results in temporarily closing the pipeline. During pipeline maintenance or shutdown, no source water can be provided to the City or Tri-State. As a result, a water storage storage reservoir with a two (2) to six (6) week capacity had to be created and lined with a geomembrane to limit leakage. This reservoir liner system also had to be designed for a rapid drawdown (larger water discharge volumes) due to demand or operational reasons. This proved challenging because there are few geomembranes that can withstand the design rapid drawdown and provide the factors of safety required by the State of Colorado Dam Safety Rules and Regulations. The challenging water storage reservoir was designed by J&T Consulting with civil operations performed by Sema Construction. The geosynthetics portion of the project is comprised of a 12 inch thick (0.3 m) gravel layer and the following liner system from bottom to top: an 8 ounce nonwoven geotextile underlayment, 36 mil thick double sided textured reinforced polyethylene (RPE) geomembrane, and an 8 ounce cushion nonwoven geotextile that served as protection from the 18 inches of cover soil. To accelerate construction, increase quality, and make construction more modular and predictable, the RPE geomembrane was pre-fabricated, which reduced field welding by approximately 80%. Figure 2 shows some of the pre-fabricated panels being deployed. The project involved considerable creative details due to the inflow and outflow structures and requirements,as well as spillway (see Figure 3). The nonwoven geotextiles were also pre-fabricated to accelerate construction. In addition to the standard quality assurance(QA) procedures for a bottom liner system, a third party leak location survey was performed aftercover soil placement (see Figure 4) to minimize leakage. This survey found nomajor defects to the liner system even after cover soil placement. This was confirmation of the success of the project by J & T Consulting, Raven Industries (manufacturer, fabricator, and installer), and Sema Construction. The Taproot Storage Pond is a fresh water storage pond intended to service oil fields in Northeastern Colorado. This pond also had a rapid drawdown design issue because the drilling process utilizes a large volume of water for the oil/gas well development. 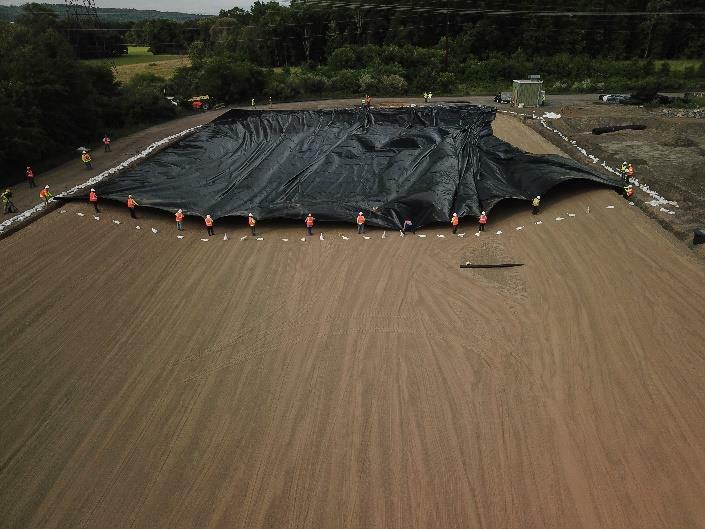 The bottom liner system consists of a geomembrane placed on the existing fine-grained soils that had to be ballasted to prevent failure during rapid drawdown. Also designed by J & T Consulting, with civil operations performed by Northern Colorado Constructors, this project posed many challenges from a design and construction standpoint. A geomembrane that could not only withstand the harsh chemical and windy conditions of the eastern Colorado plains, but also could be installed in a short installation window, was needed. Raven Industries’ 45 mil thick RPE geomembrane (see Figure 5) was used because of its durability and longevity in harsh conditions, as well as designing of an integrated ballast system for the slopes that would ensure that the high winds and rapid drawdown would not affect liner system integrity. The FGI Engineering Innovation Award provides recognition for engineer(s) who have creatively used fabricated geomembranes to successfully fulfill a client/owner’s needs including, technical requirements, scheduling, and budget. The Fabricated Geomembrane Institute (FGI) is pleased to welcome its newest associate member, Hilts Consulting Group, Inc. Hilts Consulting Group (HCG) is a civil engineering firm founded in 2003 and is located in Yorba Linda, California. Engineering services range from project inception through construction including feasibility studies, peer reviews, value engineering, preliminary design reports, final designs, construction documents, construction administration support, construction management, construction observations and inspections, field investigations, owner’s representative, constructability reviews, forensic investigations, and expert witness. 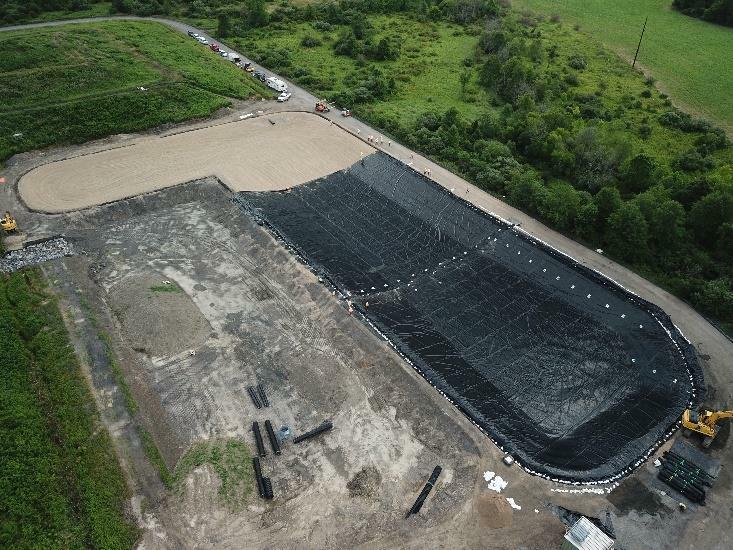 HCG specializes in geomembrane floating covers, liners, and baffles for potable water, wastewater, biogas, recreational, industrial, and oil & gas facilities. Their FGI liaison is Doug Hilts, President of HCG, who can be reached at doug.hcg@hiltsconsulting.com. Please help us welcome HCG to the FGI!!!! The main objective of this ongoing project is to investigate the 30-year durability of PVC geomembranes and PVC chemical fusion and hot wedge-welded seams. At the beginning of the study, samples of three 30-mil (0.8-mm) geomembranes from three different manufacturers were placed along the bottom of a double-lined mine settling basin at the reclamation site. The weather extremes and the harsh winters with many freeze/thaw cycles provided an excellent venue to test the durability of these geomembranes. The settling basin contains mine drainage that has been neutralized with magnesium hydroxide from mine waste rock piles. Three strips of PVC geomembrane–originally 6-feet (1.8 m) wide and 50-feet (15.2 m) long—were installed in 1995. After exhumation and sampling events two, four, five, ten and twenty years after placement of the samples, the test strips are shorter but still buried in a 6- to 12-inch (15–30-cm) thick sand cover at the bottom of the basin. Each test strip contains a single seam that runs the entire length at the center line of the test strip. Two of the strips have chemical seams, and the other has a 1.5-inch (3.8-cm) wide single wedge welded seam. 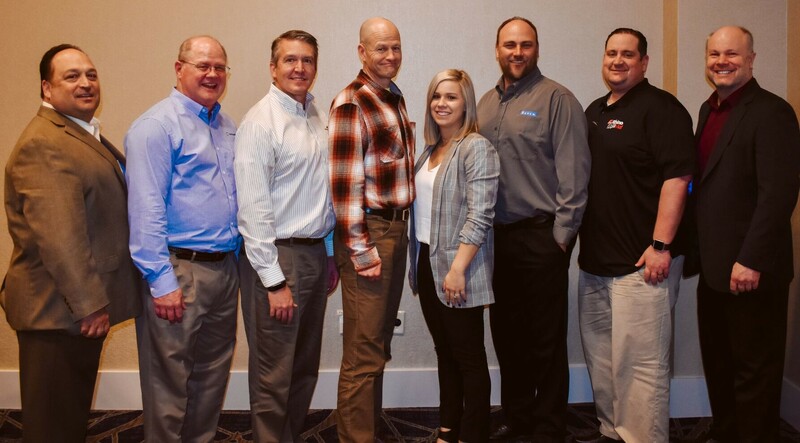 The Fabricated Geomembrane Institute (FGI) inducted new Officers and a new Board of Directors during its biennial membership meeting in Houston, Texas on February 12, 2019 at the Geosynthetics 2019 Conference. The FGI’s membership meeting was attended by fifty-seven (57) people. 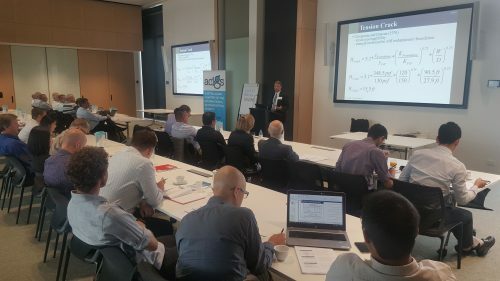 In addition to introducing the new Officers and Directors, Timothy D. Stark, FGI Technical Director and Professor of Civil Engineering at the University of Illinois at Urbana-Champaign, reviewed the current state of the FGI, including current activities, finances, and goals of the research institution, as well as presented the FGI’s 2019 Engineering Innovation Awards.